Welcome to Huntington, a charming little town where if you look close enough, your dreams will come true. Help Huntington´s shop owners find more than 1,200 unique, and cleverly hidden, items for their customers and earn enough cash to open a shop of your own. Featuring two great ways to play, an innovative hint feature, endless re-playability and more, this eye-popping challenge from the creators of the Super Collapse! series will bend your brain and dazzle your eyes. 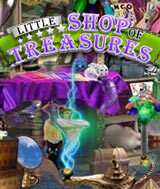 Find your way to fun at the Little Shop of Treasures today. Comments: Although this is Bright and Colorful, I got bored quickly. The scenes are crowded and the items are fairly easy to find. There is a very thin story line. There are no puzzles but after a few scenes the antique shop get upgraded by the program, not by you. Maybe I'm spoiled by other HOG out there but this one got boring pretty fast.